Zapier is an automation integration platform that connects and automates repetitive processes of two or more applications you use. And it does so in a matter of few clicks. This is a really great way how you or your company can become more efficient. Let’s face it, nobody likes to do repetitive tasks which can take up a big portion of your day. That is where Zapier comes in handy. This automation platform creates integration scenarios that work for you. Two or more applications can be put into those scenarios. One application triggers another application which subsequently performs an action. These scenarios are so-called “Zaps”. A zap can be activated when, for example, you receive a new email to your mailbox, which instantly triggers an action in form of a bulk SMS message that is sent to all your selected recipients. As you can see in the example, you wouldn’t have to move a finger to do these two tasks. Yet all would be done automatically thanks to Zapier. What is BulkGate SMS integration for Zapier? BulkGate is a messaging platform that focuses primarily on individuals and companies who need to communicate with their customers via SMS messages (other channels are coming soon!). But in fact, everybody can take advantage of our solutions. Especially because of our new Zapier SMS integration. This integration is built for those who have either limited coding skills, can’t connect an application via SMS API or other integration mean, or simply don’t want to waste time building something that has already been built. This Zapier SMS integration will give, whoever wants to use it, a possibility to send bulk SMS messages, SMS notifications, receive delivery reports and credit balance statements. SMS messaging – bulk text messages and SMS notifications – will probably be the most important actions for you. Bulk SMS can be particularly useful when you want to communicate with your team members within a company, send promotion to a certain customer segment, let your club members know about upcoming events and much more. You can therefore send 1 to infinite text messages to infinite number of recipients. SMS notification, on the other hand, is a great tool of notifying customers, one at a time (for now), about their orders status, receiving SMS when a new lead is added to your CRM system, etc. This article could be easily focusing only on name-dropping examples and ideas how you could use our Zaps. Because there are so many ideas and imagination is the only limit. How can I connect my application with BulkGate? It is really simple to set up your first Zap that will use BulkGate SMS messages as actions for your applications. If you find any problem during the Zap set up, read this thorough post on our helpdesk. The SMS integration itself is, as all of our other integrations, for free. The only thing you have to pay attention to are the SMS prices. However, we are offering great prices for SMS messaging all around the world, so you don’t have to be afraid that the communication via BulkGate would be costly for you. Just check out SMS price list and see for yourself. I have already mentioned above that imagination is the only limit when making new Zaps. Of course you may be also limited by actions that you can choose from, but that’s another story. Here is a short list of examples of how can be Zapier SMS integration beneficial for you. Can’t find Zaps you are looking for? 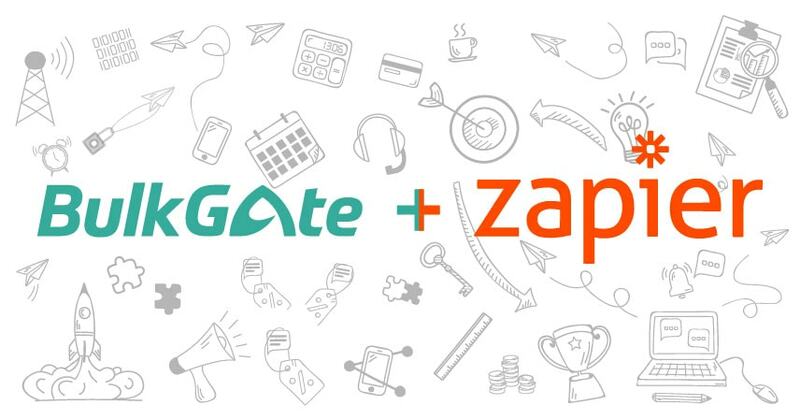 After you use Zapier to connect your favorite apps with your BulkGate account, you will start seeing the differences. You’ll bring your attention back to more creative, important and non-repetitive tasks thanks to the BulkGate SMS integration for Zapier. On top of that you’ll save time and increase effectivity. Life will become easier. There are really no hooks.